Now that I've discussed all about San Diego, it's time to drive the PCH recap our time spent in the one and only, Orange County! Sadly enough, none of those happened, except I did eat brunch right in the same complex that Terry Dubrow's office is at, and I did manage to stalk find Lauren Conrad's house that she grew up in. Do these count? Let's just say yes. Not having visited the area before, I will say that Laguna was not what we pictured in our heads. You know how you have a certain "vision" of what a city will be like, but in reality when you go, it's not that at all? This isn't meant in a bad way because Laguna is SO nice, but it just isn't what we pictured it to be. Billy described it best when he said that we thought it would have been a lot more commercialized than it is. I could definitely have sat there for like a week. We also walked up to Las Brisas (a hotel and restaurant) to walk around the back and see the views. This is a great seafood restaurant in the area that I recommend. Did I mention yet how much money is in the Orange County area? It is unbelieveable. Here we are driving around in our Ford Fiesta rental car being surrounded by Ferrari's and Rolls Royce's. We had a good laugh about this! The homes? They are those ones you see on TV and dream about. Since Billy and I love to drive through rich suburbs/neighborhoods, after some internet stalking we made it past the gate (thank you young sir who checked my ID and let us pass-hope you aren't fired today) up to where all the million dollar homes are and caught a glimpse of what I'm told is Lauren Conrad's parents old house. We spent all day in Laguna, but after recommendations from Natasha (remember how I met her in Lake Tahoe last year?! ), we decided to stay the night in Newport Beach. Laguna was really cool, but is kind of a sleepy town at night, and Newport has much more going on (in my opinion). 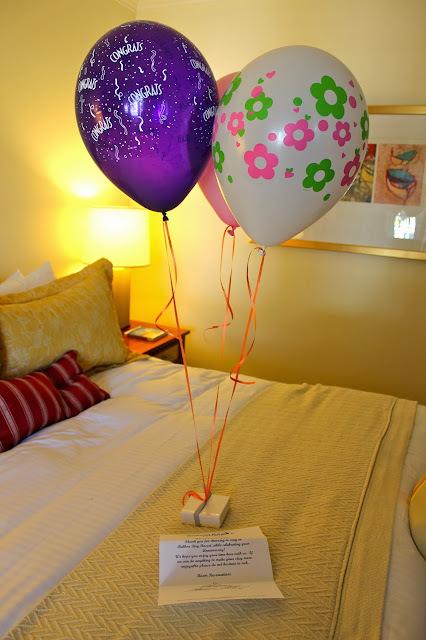 Our resort that we stayed at in Newport Beach, Balboa Bay Resort, was one of the nicest places I've ever stayed and what were the chances that Natasha was staying at the exact same resort for her best friends wedding on the same weekend?! We didn't plan that, but it was just an added bonus to be able to see her as well! I originally booked this resort as a surprise to Billy because it is on the water and has million dollar yachts right in the back (both of which are Billy's favorite things). I knew he would LOVE it. I never imagined it would be as nice as it was, though. Balboa Bay Club is a 4-Diamond Resort and the only full-service waterfront property on the coast in Newport Beach. It has a beach, two pools, and bar right in the back with amazing views. You can even rent duffy boats, kayaks, and paddle boards from here and spend the day out in the water. We are pretty much obsessed with Newport now. It is such a ritzy area....everyone is gorgeous (we felt somewhat out of place, haha), all of the buildings are super nice, and of course it has Balboa Island which is so cute and fun to explore. A must when visiting Newport. Our resort set up anniversary chocolates and balloons for us when we arrived and our balcony had this amazing view of huge homes and some of the water. 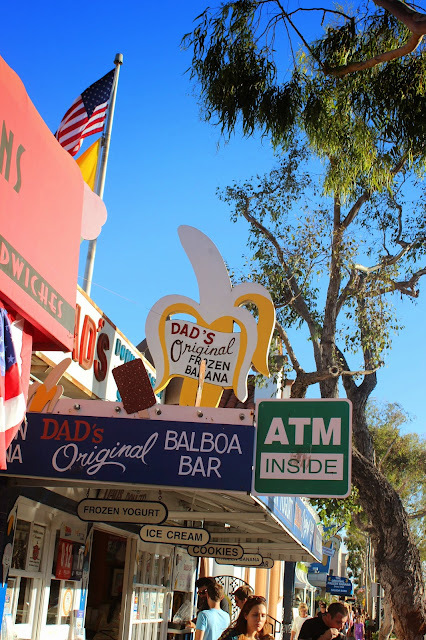 When you are on Balboa, take a walk around to look at all the beautiful homes and also you must stop at Dad's to get a frozen banana (and a bar if you want options)... SO good! We were lucky enough to grab brunch before we headed out at a cute place called Haute Cakes with Natasha, her husband Ryan, and two of her best girlfriends. It was so nice being able to catch up with them and meet some of her friends-they were so sweet and our brunch was delicious! When we left Newport, we decided to stop at Huntington Beach briefly (which is on the way to Malibu/LA) to see the area and to get some shopping in! Now you can see why I love driving the coast so much, right? Stay tuned for the last part, covering Malibu and LA! this post makes me all warm and fuzzy inside, I LOVE Laguna. It's so peaceful. My boyfriend and I go a couple times a year just to get out of the crazy of LA. But I've never been up in the hills, those pictures of your views are AMAZINGLY GORGEOUS. Wow! Your pictures on this trip is out of this world! Just gorgeous! Makes me want to do the exact same trip. Love reading these recaps!! After spending time in northern CA and loving it, I definitely want to go back and explore southern CA, especially San Diego! Ahh!! I love it all!!! I would definitely stalk celebs too when we go to Cali!! HAHA! Aaaand I'll be hitting you up for some help when planning said trip! HAHA! Bahaha! Love your housewife references...cause that would be my dream visit too ;) Love the Newport/Laguna area! I have family in Newport so any chance for a visit...I am there ;) Glad you guys had a great time in Cali..the photos are gorg! Love that you went to LC's house. It always looked so incredible on the show. And crazy fun how you were there the same day Natasha was in the wedding! How fun! Ahhhh California life just seems so chillaxing. The Cliff looks absolutely AMAZING!! Love that pic of you with the brewski. LC's house!! as in the one we used to see in Laguna Beach/The Hills?! AHH i absolutely looooooove driving through rich areas and neighborhoods too to see how those people live..its so extravagant! cannot believe those yachts are literally RIGHT THERE at teh beach edge. Breathtaking!!! Your pictures look so gorgeous! all I could think about was The OC while reading about Newport! Such gorgeous homes & pictures! I too love to drive around and look at houses and views. You mentioned that Laguna isn't very commercialized. My parents good friends have lived in Laguna for almost 30 years and the husband was the city planner for 20 of them. They purposely didn't want it to be commercialized to keep the small town feel. About 5 years ago before moving to LA my husband and I came to visit them and I was like a kid in the candy store listening to them tell me all about the show Laguna Beach. Their girls grew up with all the kids on the show. I'm sure you've mentioned this before but what camera do you have that you're taking the pics with? I use a Canon Rebel t3i and love it. Thank you! Laguna/Newport is probably my favorite area in SoCal! Makes me miss living near there!!! And you're right, my husband and I drove up PCH halfway up the coast, and the views never get old! I've always wanted to visit Laguna after watching the show! Those houses are GORGEOUS!! Love your pictures. I LOVED Laguna. It was one of my favorites. We walked around the high school where The Hills stars went to school and I thought that was the coolest thing ever. I also went into that Starbucks in your pics to potty and get a hot cocoa! LOL, it was July too! Great pictures! Everything is so beautiful! And love Balboa Island, it's so cute, especially all the cute homes! Orange County is pretty much my favorite place ever. Laguna is so heavenly and that is definitely LC's house. When I lived there I stalked it on the regular. Such a good find!